Can a kinship problem be solved by DNA testing? Which relatives should be tested? Is it worth asking for an exhumation? These are questions that are occasionally of great importance, and which it has been nearly impossible to answer before the introduction of the Kinship Simulation feature of the Automatic Symbolic Kinship Program. To explain the concept of the simulation progam, we begin by reviewing the use of the Kinship program in the context of a particular example. H : N + ? evaluates the strength of the genetic evidence in all relationship problems. Are S and H half-siblings? Two family trees depict two hypothetical explanations for the genetic data. To use Kinship, each tree is transcribed using : and + notation to define all child-parent relationships. These two explanations are merged, using / wherever alternative people occupy a role, and the composite is typed into the program. Genetic types are supplied for some or all of the people involved. Kinship then derives and evaluates the algebraic expressions. A completely inconclusive likelihood ratio, as in this example, seems like very bad luck. Could it have been predicted? What to do next? Kinship Simulation answers such questions. H : M + Dad/? 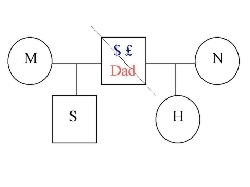 Kinship simulation can also predict the benefit of additional tests. What would happen if a panel of SNP's were applied to M, N, S, and H? 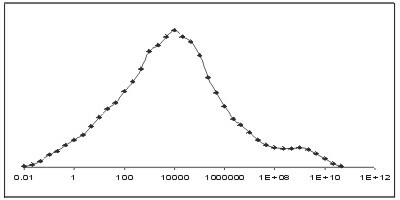 The incremental performance that can be expected is shown by the set of simulations at right. The same idea can be applied to any scenario, even before any DNA typing has been done. 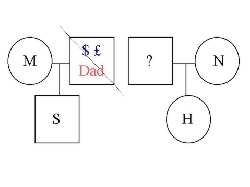 Therefore, Kinship simulation is a research tool that can be used to predict how well a given DNA panel will perform on any specified relationship problem.